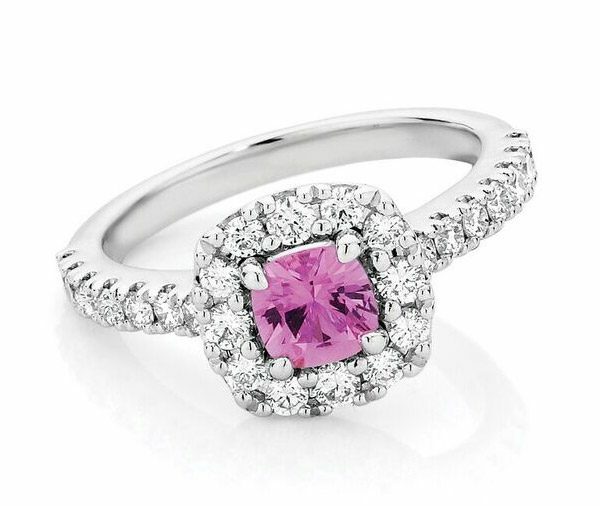 This pretty bright pink radiant cut ceylon sapphire is set in four claws with claw set round brilliant cut diamonds in the surrounding halo and band – beautiful as an engagement ring or dress ring. Make it your own with any coloured centre gemstone. Model image features 0.70ct pink sapphire . Available in platinum, 18ct white, yellow or rose gold or any other precious metal combination.